The first guest in my Back2School Bentoing Blog Series is Nina from Mamabelly’s Lunches with Love. I am thrilled to have Nina share some of her easy tips for making lunch fun. I think after seeing this post you will agree that you can do it!! Please visit Nina’s blog and follow her social media. Packing fun lunches is not as hard as you think and doesn’t necessarily require a cabinet full of lunch supplies or artistic skills. 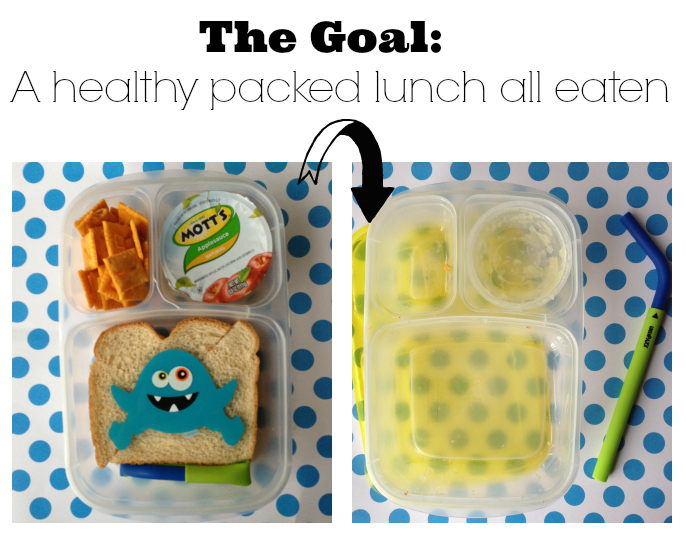 With a few (and inexpensive) touches you can change your child’s lunchbox into a fun lunch! In the picture above I added a reusable silicone straw and a cupcake decoration from the party store to dress up the lunch. My kids were thrilled to slurp their applesauce through the straw and with a quick cupcake decoration I made this simple lunch more exciting. Same with this St. Patrick’s Day lunch. I added three St. Patrick’s Day themed cupcake rings from my local cake store and made this simple lunch festive and fun! To add some color and fun I simply added a cute orange mini silicone cup to hold some Almonds and dressed up this simple divided bento box. Silicone cups can also serve as dividers and enable you to pack smaller portions and a larger variety of food which especially appeals to younger children and picky eaters. This lunch was made more fun with a cute plane sandwich. The cutter is easy to use (just press down and done) and removes the crust while making your kids sandwich exciting and fun! These mini sandwiches were transformed with a sandwich stamp. No artistic skill required. But the outcome is an adorable and appealing lunch. Here is another sandwich cutter is that makes cute animals sandwich. It cuts the crust off, which is great for picky eaters. Quick, easy and fun in no time at all. Adding a fun lunchbox note – no matter if homemade or similar to this store bought card – sure will put a smile on your child’s face and make lunch a little more special. But even if you don’t have any of the tools above you can still make a cute lunch. This summer BLT lunch was simply made special by adding three Goldfish crackers and with two deli sandwich picks. Similar ones are available at the Dollar Store. I hope I could show you a few tips and tricks on how to transform you child’s lunchbox from drab to fab with a few simple steps. For more ideas on making lunch fun visit my bento basics page. Diana - these are all sooooooooooooooooooooo CUTE. Bentos are not just for kids!! Make yourself a cute one! Great, fun ideas! Love the dividers. Now I'm getting inspired for back-to-school lunch prep. Oh good! I hope you kids enjoy them! Nina GREAT post, Diana told me this was coming up and I'm so excited to see some ideas! I want this next year to do this for the kids lunches. Nina does a great job with her lunches. So simple but effective!! She's very creative and I hope she inspires you to make cute lunches for your boys!! Hi! I'm stopping by for the first time from All Our Days link up. These lunches look so fun. Just a quick question...where do you get your containers? I've been looking all over and can't seem to find the compartmentalized ones. Thanks! My sister has gotten me some great stuff at Japanese shops in the Bay Area and I've ordered things off eBay from Japan. Did you see this link at the bottom of this post? It has links to my Nina's favorites. I just got some cool containers at Schnucks this weekend. I am thinking about doing a giveaway since I bought 2. Thanks Joanna. Nina did a great job! Thanks Bonnie! Nina did a great job with this guest post. I hope you will check out her blog! Bento-ing is even easier when you are home because you don't have to make it portable. Lovely touches - the whole Bentoing thing seems like such a good idea. Nina's got genius ideas! I'm out of school but I wouldn't mind going back if I had cool lunches like this every day. Dropping by from Whatcha work-up Wednesday.